After reviewing the vertebrae, paleontologist Othniel Marsh of Yale University’s Peabody Museum named the dinosaur and published a description of it. 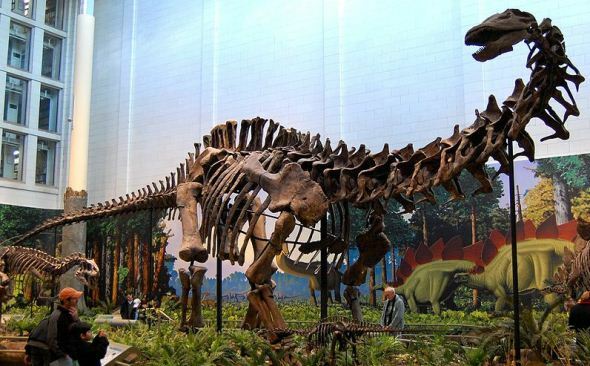 Two years later, Marsh gave the name Brontosaurus to a skeleton recovered from Wyoming, which later was determined to be from the same species. In all, Lakes recovered three skeletons from what is known today as Dinosaur Ridge. An Apatosaurus typically measured 72 feet in length, weighed 20 to 35 tons and stood on four legs to support its massive body, long neck and tail, and small skull. The name Brontosaurus was the most popular for decades but has been supplanted by Apatosaurus, the official name. The Apatosaurus is from the Jurassic period, about 150 million years ago.